When selecting multi-range pressure sensors, there are certain things to be cautious of. Often a "one size fits all" pressure transducer is chosen for expected cost savings and inventory control; however this decision turns out to be a bad idea. Issues arise with inaccuracy and poor stability on low range applications where the range output adjustment is simply pushed too far. The common turndown ratio for most multi-range pressure transducers is 10:1. In order to achieve a low pressure range, some manufacturers use their high range sensors and over-boost the circuit gain to allow for low pressure sensitivity. For example, a 5” Water Column (WC) sensor may be used to achieve 0.1” WC full scale (FS) operation. This setup requires a 50X increase in gain from the circuit over standard sensor/circuit sizing. Despite intricate correction from microprocessor based circuits, you'll probably have to deal with significant output noise along with short and long term instability. Setra maintains excellent accuracy and stability for its multi-range pressure sensors by limiting the turn down ratio to 3:1 and by using true low range sensors that are carefully selected for adequate output. 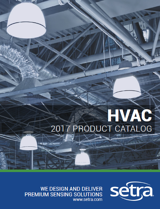 Our sensor selection is based on fixed motion sensors that have uniform, high performance over all pressure ranges. The patented stretch diaphragm capacitive sensors have both high-output at very low pressures and extremely high overpressure capability. Tensioned metal diaphragm sensors have great overpressure performance so the low ranges are not load-limited like other technologies. 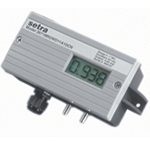 A great multi-range pressure transducer that allows for this flexibility is the Setra Model 267MR. This differential pressure transducer offers multiple output options and an optional LCD display for easy viewing of the pressure reading. Feel free to leave a comment below or contact us for more information.